Puneet Thiara – A blog on business, marketing, & lived moments. More Options Than a “Like” Button are Coming! Mark Zuckerberg revealed that the testing phase is coming soon. Major news networks are reporting that this announcement means a dislike button, however if you actually watch the video you see Zuckerberg talk about how the company didn’t want to build a dislike button to vote up or down on a post. Although he says that the company has listened, he doesn’t actually specifically say it will be a “dislike” button. Instead he says they have an “idea” that they are going to test soon in order to let users express understanding and respond to something that might be considered awkward to hit “like” on. It will be interesting to see what this new roll out will actually be, and if it is indeed a “dislike” button. It’s intriguing how they will apply it so Facebook doesn’t become a “down voting” community as Zuckerberg was initially concerned about. The Q&A was done through live streaming and this is obviously something that we can expect to see rolled out eventually. This could be a cool tool for travel, any experiences, or even celebrities reaching out to fans for marketing purposes! Mark shared an interactive gaming experience that I am actually pretty excited about; physically playing ping-pong with other users online. This means you would both have a paddle in order to play this game. This is going to be a great tool to connect with others online internationally through Facebook. This is currently being rolled out and will be connected through Facebook Chat. Becoming a one stop destination for all communications through mobile devices is a huge advantage, and the success of this roll out could make or break this option. As Facebook continues to grow not only as a company, but also in their contributions to society, it will be interesting to see just how much the company can expand. Definitely one to keep an eye on… until then, back to my Facebook feed. I am obsessed with food and I’m not afraid to admit it. For example, out of my last twelveposts on Instagram, only four of the photos don’t include food in them. If you make your way to Urbanspoon you can find millions of users giving reviews to local restaurants (and posting tons of food pictures) in six different countries. You can find sections on the “Talk of the Town”, and on the most popular restaurants. Users can read from a combination of critic reviews, blogger reviews and user reviews. Recently Zomato, based out of India, acquired Urbanspoon for $50 million dollars US. Why? Urbanspoon is in six different countries and has a stronghold in North America. Urbanspoon is a top rated app on iTunes, with over 20 million mobile subscribers in total. But this will not just be an acquisition where the site continues to run as is; the company intends on slowly phasing out Urbanspoon. This is a great move for Zomato as they try to get into North America. Their current strong markets are India, of course, United Arab Emirates, New Zealand, the Philippines, South Africa and Indonesia. So naturally since my favorite go-to site is going to disappear forever I had to check out Zomato’s site. I will tell my future children that I come from an era before Zomato moved into North America, and of the life in which Urbanspoon was my best friend, and when I was told Pluto was a planet , then not a planet, then a planet again, but I digress… Zomato’s site is clean and to the point. The site has a more categories on its landing page for someone looking for a recommendation without the extra searching than Urbanspoon does. Th e actual restaurant page layout seems pretty similar across the board, the map, address, information, photos, and reviews. What I struggled to find however, is something separating the reviews by users, bloggers, and critics. I know that here in North America food bloggers have a huge following and a lot of them use Urbanspoon as a way of integrating their posts online. It will be really interesting to see how this move will effect bloggers and how they will respond to this takeover. Overall it will be interesting to see how I like Zomato as it moves into the Vancouver restaurant scene. I am cautious, but excited, to see how this will make me spend even more time searching through food pictures when I’m hungry. Fyuse – The New Selfie App? According to an article on Tech.co, there are at least 93 million selfless taken every single day, and smartphone users check their phone 100 billion times a day! It makes complete sense to see different tech companies trying to get even a tiny part of that market and Fyuse (Available on iTunes and Google Play) is one of those. Launched in 2014, Fyuse offers users the technology they need to take 360-degree interactive photos. As I’ve mentioned before, selfies are completely an “in” thing right now… so this app serves its purpose as a beautiful selfieapp, but how can you apply it to marketing? One idea that immediately comes to mind is real estate. I recently bought an apartment as an investment property and they had introduced a new 3D technology app for their building… but it crashes. A lot. I can see Fyuse being a great way for real estate agents and property owners to use 3D visuals of properties to help potential buyers and investors really see the property. A second thing that comes to mind is using the app to sell vehicles. If my future Audi R8 was shown on Fyuse I would look at it many, many times in a day. These are just two different examples of different ways the app can be used. In reality, putting products under the fingertips of consumers allows them to connect directly with the product and get a complete visual that a photo alone just can’t provide. Sephora is a chain of cosmetics stores and a French brand that is rapidly growing each year… if you haven’t heard of it, as your girlfriend, wife, or any other individual that wears makeup. They were one of the first to enter the e-commerce world in 1998 and one of the first to enter the mobile site market. According to an article on an interview with Julie Bornstein (chief marketing officer and chief digital officer for Sephora), over the last three years Sephora’s mobile sales have grown 100% each year. Julie also mentioned the importance that Sephora places on having their web development team in house. “Marketing and internal IT expertise are both at the table. Each group can imagine things that are possible that the other might not have dreamed of.” The result of this collaboration can be seen in the strength of their digital strategy that other companies can only dream of. 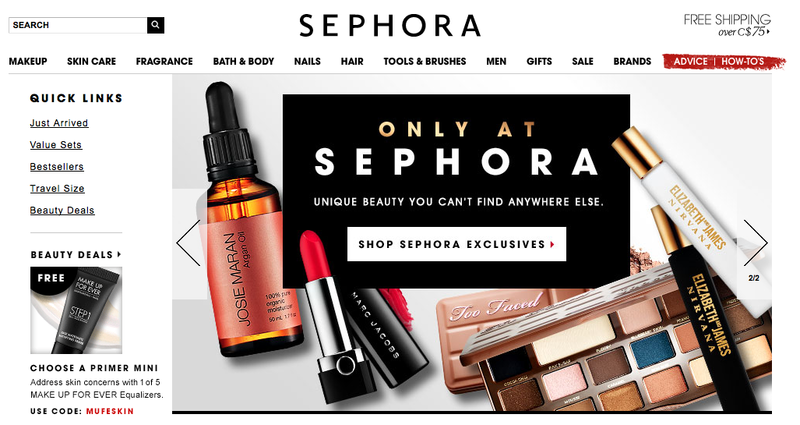 So what makes Sephora’s digital strategy so special, so game changing? To sum up the rest of this article… they have every corner covered. For starters, almost anything you can get in-store you can find online and vice versa (sans a few specials specifically for online or in-store). Going in to a store you can get free samples of most of the items in the store, and when you shop online there are three free samples (customers get to choose which ones) that also get mailed out. Every week there is one extra sample that Beauty Insiders (more on that later) get to choose from along with the three samples. This means that customers don’t feel the need to go in to the store to get the free sample perk, and feel satisfied each time they receive an order with extra little item they didn’t pay for. Win-win situation! What does this mean when we’re talking about Sephora’s digital strategy? Customers can go online to their website, punch in their Color IQ number, and get a result of all of the products (and shades) that are recommended for them. Anyone who has tried to find the perfect foundation amongst the thousands of different options knows how difficult this task really is. While in-store customers have the option of having the results emailed to them so they can shop online and remember what the Color IQ number actually was. In addition to being able to purchase a product on their website, there are several other benefits built in to their website. The first one is Beauty Board, built as almost a social media of its own. Users can post pictures of their makeup and “tag” the products that they are wearing. Other users can like the pictures and also click on the products in order to purchase it themselves. This is a brilliant idea. Not only are Sephora customers sharing with each other, they’re also indirectly promoting the products that they’re wearing. This is a big win for both Sephora that wins the sales, and for customers that get to see real pictures of people wearing makeup products before making purchase decisions. This is a great way of having people be a part of a community online, making them less likely to stop using the site once they get engaged in Beauty Board. 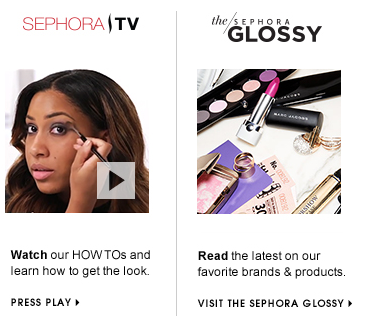 Sephora TV and The Sephora Glossy are two other ‘How-To’ features on the website. On Sephora TV customers can learn different techniques and methods for applying makeup and using different products sold at Sephora. The Sephora Glossy is almost an online magazine exclusive to the Sephora site that keeps readers up to date on news, trends, inspiration, new products, and different methods and techniques. 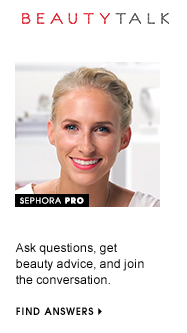 Sephora has a Beauty Talk segment on their site as well that is essentially a discussion board for users to ask questions, get beauty advice, and comment on discussions. Sephora is very active on its Pinterest, Instagram, Twitter, and Facebook pages. The pages have millions of followers with more following the brand each day. This means that even while customers aren’t on Sephora’s website, they’re still connected via most of the social media platforms that they’re on. What’s better than a store through which you can get free stuff using your points? Nothing. Becoming a member at Sephora is absolutely free, and any user gets a birthday gift during their birthday month (redeemable online or in store), rewards, and access to promotions. When anyone joins they become a ‘Beauty Insider’. If the customer spends $350 a year or above, they achieve ‘Sephora VIB’ status. Sephora VIB’s get all of the previously mentioned benefits including first dibs on new products, seasonal VIB-only gifts, advanced access to sales, and private VIB only shopping events. Shoppers that spend more than $1000 per year get VIB Rouge status and all of the previous perks plus extras. These extras include free shipping on all orders, unlimited access to the beauty studio, exclusive rouge events, and special gifts. The points earned by members can be redeemed for items from the Reward Boutique both in-store or online. When a customer is browsing the website online, they can click on a little heart over a product and it gets added to their ‘Loves’ section. This is saved on the users profile and users have all of the items they are interested in saved in one place. Another great part of the website, combined with the membership, is that it saves all purchases made in-store and online. This means that shoppers can simply click on a product on their purchases list and order it when it runs out in a very efficient manner. Both of these items help users see the benefit in shopping online at Sephora.com instead of other retailers. Even free samples the customer ordered are included on this list in order to be a quick find for customers after they run out of the small size and forget what they had ordered. This also presents a unique selling advantage for companies trying to get samples out through retailers. In the in-store method of receiving a sample, typically customers receive something and misplace it or throw it away once they are done with it. This is definitely a value for suppliers looking to team up with a retailer that is doing samples right! Considering Sephora has been owned by Louis Vuitton and Moet Hennessy LVMH as of 1997, it’s remarkable to see what a powerhouse of a luxury brand can do when it has the right team of digital experts.